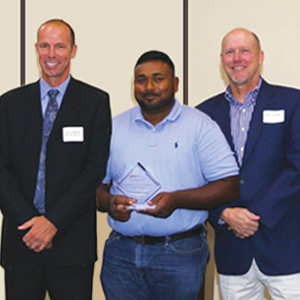 The latest account for Jani-King of Orlando franchisee Fahem Alam may have been the result of his persistence, but his overall success with Jani-King comes from a great attitude and willingness to do whatever is asked by the customer. “My philosophy with all of my customers is very simple,” said Alam. “I just say, no problem sir, I’ll take care of it”. It’s that kind of attitude that has built Alam’s business to include more than 100 customers. The latest of which is a large fitness center in the same area as other customers. Alam says that the regional office not only plays a big role in his current success, but it was their passion for the Jani-King program that convinced him to initially invest in a franchise.